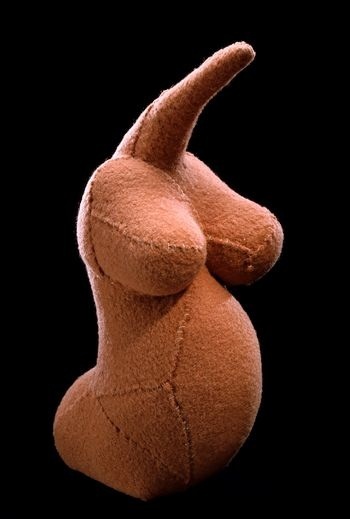 Louise Bourgeois, Fragile Goddess, 2002, cloth, 31.7 x 12.7 x 15.2 cm, courtesy of The Sammlung Scharf-Gerstenberg Museum. The Sammlung Scharf-Gerstenberg, Berlin’s museum of Surrealist art, is currently holding its first temporary exhibition co-curated by Udo Kittelmann and Kyllikki Zacharias. Kittelmann had the idea to create a curatorial dialogue between the work of Louise Bourgeois and Hans Bellmer before the museum’s opening in June 2008. 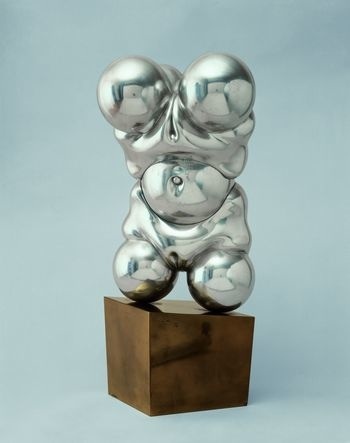 ‘Hans Bellmer-Louise Bourgeois Double Sexus’ consists of over seventy works by Bellmer and Bourgeois, including sculpture, graphic art, and photographs. Hans Bellmer, Die Puppe, 1935-1965, cast aluminum on gold plated bronze, 50 x 27 x 25 cm, courtesy of The Sammlung Scharf-Gerstenberg Museum. While both artists spent time in Paris during the height of the Surrealist Movement, it is believed that Bellmer and Bourgeois never actually met. Bourgeois chose to exile herself from the Surrealist Movement in 1938 when she moved from Paris to New York with her husband, American art critic, Robert Goldwater. In contrast, Bellmer actively joined the movement that same year when he fled the Nazi regime and moved to Paris. Bellmer and Bourgeois certainly differed in their social approach to the art world, but they explored many of the same themes, such as symbolism, distortion of the figure, sexual obsession, and doll-like figures. ‘Double Sexus’ shows how both artists drew on their childhood relationships, particularly their experiences with their fathers, to find the subject matter for their work. Bellmer rebelled against his Nazi affiliated father, and in turn German society. The majority of his work deals with obsessive male desire. Bourgeois’ situation was different. She loved her father and was destroyed by his decision to have his mistress move into their home. Her work is routed in the desire for self-fulfillment. 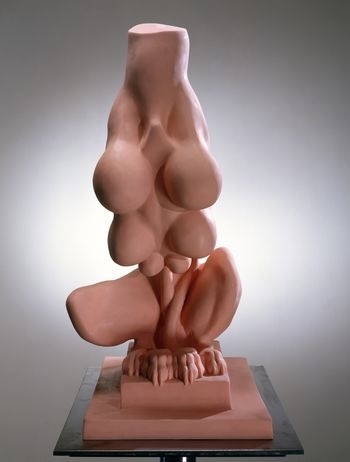 Louise Bourgeois, Nature Study, 1984/2001, pink rubber, 76.2 x 48.2 x 38.1 cm, courtesy of The Sammlung Scharf-Gerstenberg Museum. Bellmer and Bourgeois both spent their careers attempting to make problematic gender relationships visible to society. This is why they both chose the body as their subject, and interestingly they both abstracted the form in their use of materials. Bellmer uses the human form to portray sexual fantasy, while Bourgeois directly links the male and female figure to her father and mother. Dissecting the male figure was a theme in her work. It represented a dream of what she wished she could do to her father. She depicted women bent out of shape and twisted. This was a representation of what she wished to do to her father’s mistress and a tribute to her mother. By showing Bellmer and Bourgeois’ work together ‘Double Sexus’ explores the ambiguous nature of human sexuality and the relationship between eroticism and creativity. 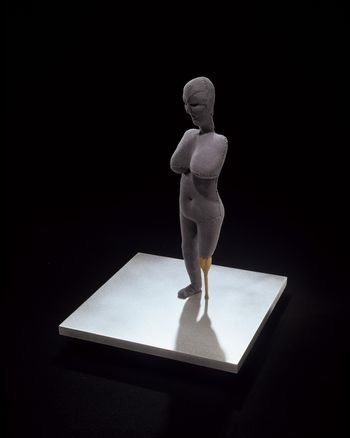 Louise Bourgeois, Ohne Titel, 2005, cloth, wood, glass, stainless steel, 41.2 x 30.4 x 30.4 cm, courtesy of The Sammlung Scharf-Gerstenberg Museum. 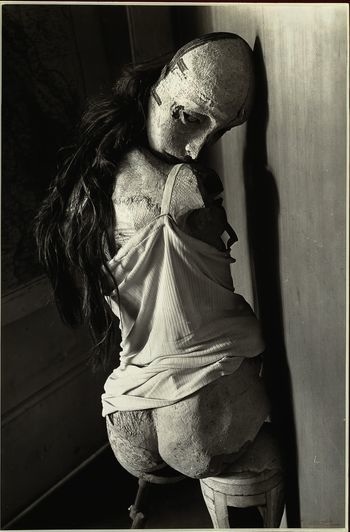 Hans Bellmer, La Poupée, Die Puppe, 1936-1938, photograph, vintage print, 70 x 50 cm, courtesy of The Sammlung Scharf-Gerstenberg Museum. Bourgeois’ work argues the objectification of the female body and traditional sexual roles. Throughout her career she studied the body as the humans place of suffering, focusing specifically on the female body and its contrasting duties to nurture and sexually service. Bellmer’s sketches from George Bataille’s handbook, The Story of the Eye; compliment Bourgeois’ uncontrolled, multi-breasted and amputated figures. These sketches resemble anatomy illustrations from a 14th century textbook, but they differ in the way Bellmer distorts the human body. Works from Bellmer’s doll project also hold striking parallels to Bourgeois’ work. Bellmer began this project to make an anti-Nazi statement. It was directed specifically at the cult of the perfect body. It is also believed that unattainable beauties in Bellmer’s life, such as his cousin, inspired the project. Hans Bellmer, La demi-pupée, Die Halbpuppe, 1971, mixed media, 124.46 x 30.48 x 25.40 cm, courtesy of The Sammlung Scharf-Gerstenberg Museum. Hans Bellmer, Sans titre, Ohne Titel, 1964, pencil drawing, 22 x 17 cm, courtesy of The Sammlung Scharf-Gerstenberg Museum. A photograph of Bourgeois, taken by Robert Mapplethorpe in 1982, titled Fillette, is also included in the show. Bourgeois is holding a larger than life latex phallus under her arm. This photograph was originally shot for her 1982 retrospective at the Museum of Modern Art where Bourgeois gained initial recognition. Robert Mapplethorpe, Fillette, 1982, photograph, courtesy of The Robert Mapplethorpe Foundation. Due to Bourgeois’ unfortunate death on May 31, ‘Double Sexus’ is significant for yet another reason. Since Bourgeois passed away there has been much argument about which summer exhibition of Bourgeois’ work was the last that the artist was actively involved in creating. 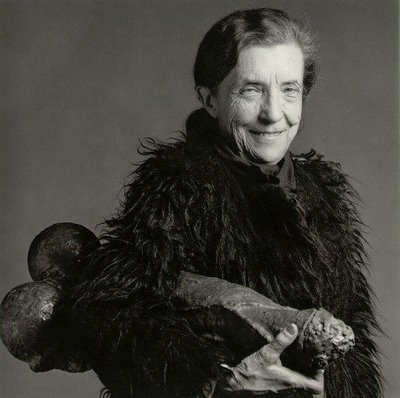 The Exberliner declared that ‘Hans Bellmer-Louise Bourgeois Double Sexus’ is the last show led by Bourgeois, but various Italian publications have claimed that the Fondazione Vedova is putting on the last show, titled ‘Louise Bourgeois: The Fabric Work.’ Regardless, Bourgeois will continue to be honored and remembered through her work. Both of these shows point out Bourgeois’ remarkable ability to work up until the very end of her life. The title of this exhibition is borrowed from the first book in Henry Miller’s three-part series The Rosy Crucifixion. Miller’s Sexus discusses his divorce from his first wife. Upon the exhibition’s closing at Sammlung Scharf-Gerstenberg, ‘Double Sexus’ will travel to The Gemeente Museum in Den Haag. This entry was posted on Saturday, June 19th, 2010 at 1:00 am	and is filed under Go See. You can follow any responses to this entry through the RSS 2.0 feed. You can leave a response, or trackback from your own site.